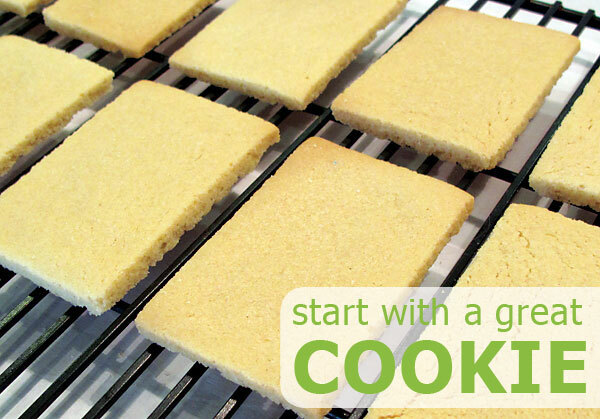 Follow the steps below to learn how to use our edible cookie wafer paper designs. We swear by our No fail Sugar Cookie Recipe, but you can use your own favorite gingerbread, shortbread or sugar cookie recipe. If time is an issue, you can also use store bought cookies. Cut out your cookie shapes to match the wafer paper design you have selected and bake. Wafer paper adheres best to cookies that have been iced with Royal Icing or covered with fondant. 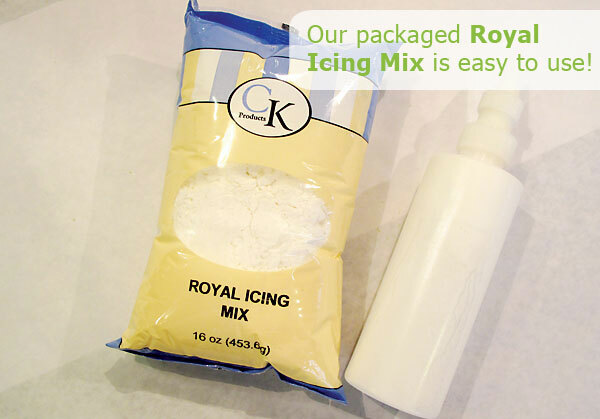 Our packaged Royal Icing Mix is easy to use, just add water and mix. Prepare the icing to a “flooding” consistency and pour into a squeeze bottle with piping tip. Note: To determine if your royal icing is the right consistency, drag the tip of a knife through the surface of your icing. If the line disappears in about 10 seconds, your icing is ready to use. If it takes longer, the icing is too thick and you will need to mix in more water. If your knife line disappears in less than 10 seconds, it is too runny and you will need to add more confectioners sugar. 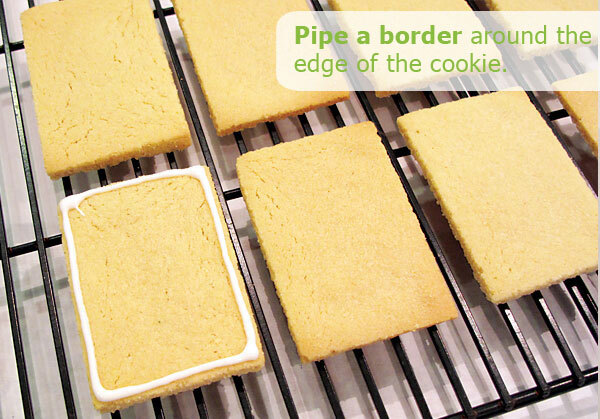 Pipe a border around the edge of the cookie and then fill with Royal Icing. As you see from the picture, the piping edges don’t have to be perfectly neat, all minor sins will be hidden! 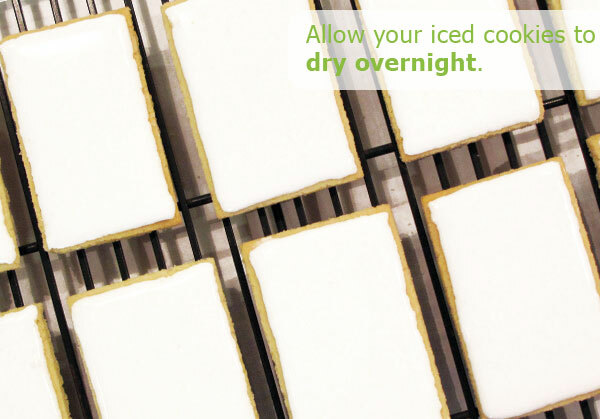 Using craft scissors, carefully cut out your wafer paper images to fit the size of your iced cookie. 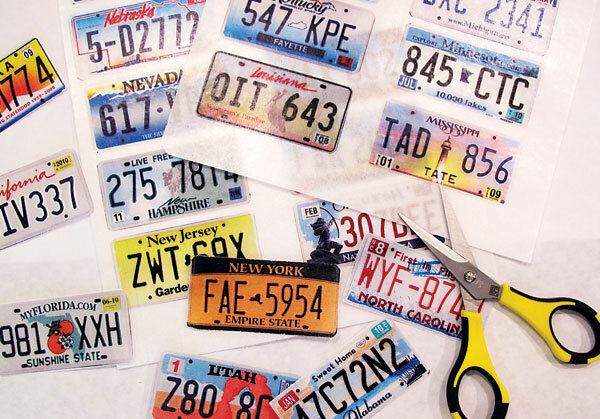 Trim the edges for a clean, finished look. 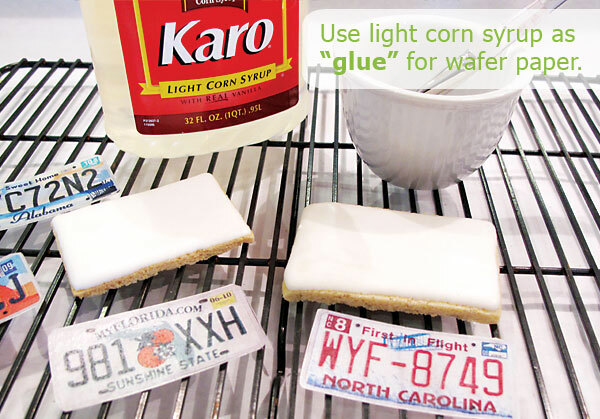 We recommend using light corn syrup as “glue” for wafer paper because it dries cleanly. You can also use clear piping gel. 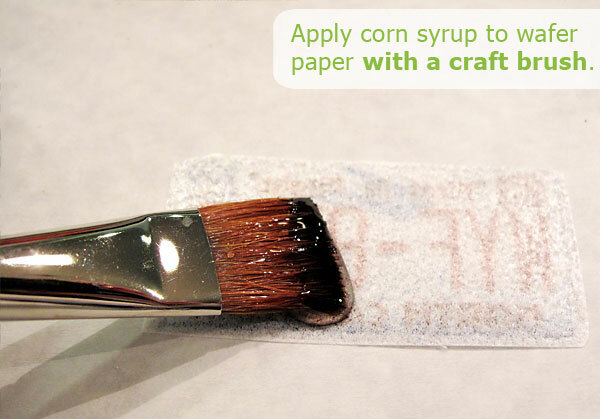 Using a small craft paint brush, coat the the entire back of the wafer paper image with corn syrup. Make sure to cover the edges well. Be careful not to get corn syrup on the image side because corn syrup splotches will show up. 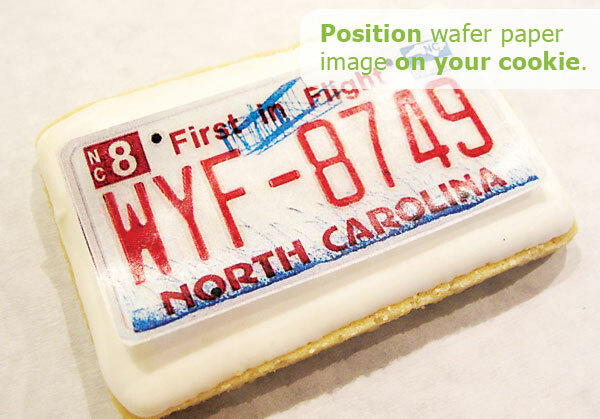 Gently paste the wafer paper image on the cookie. Wiggle it into place so it aligns perfectly on the cookie. Press down the edges well, repeating the process a few times until all of the edges stay “glued” down. 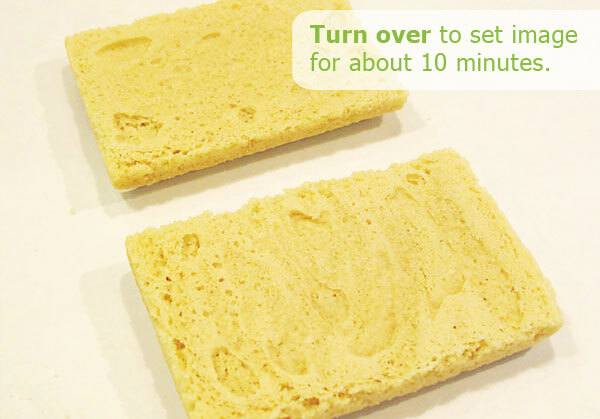 Place a paper towel over the surface of the cookies and gently smooth the wafer paper one final time. Turn the cookie over on a piece of wax paper and let set for about 10 minutes. Turn cookie back over and allow to dry completely. 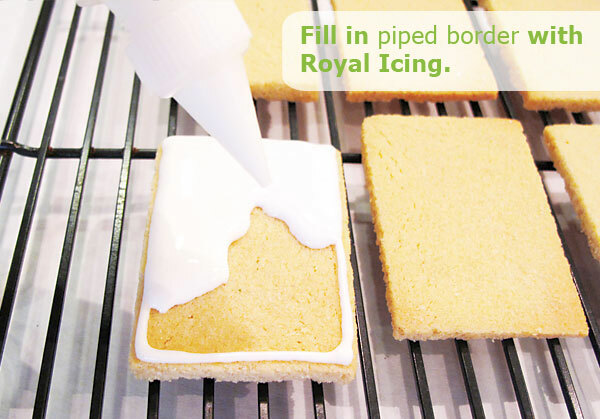 Once the cookie is dry, you can pipe decorative borders, sprinkle with glitter or add other embellishments. Download our PDF version HERE. This entry was posted in All Things Baking, Baking Inspiration, Cookie Recipes & Ideas, Instructions & How-To's, Recipes & Tips and tagged sugar cookie recipe, wafer paper by Fancy Flours. Bookmark the permalink. I love wafer paper, it is so easy to use and turns out beautifully! I ordered the Chinese New Year and Valentine’s Day sets from your site and my cookies turned out wonderful! I will be ordering more very soon! I am so glad that our Wafer Papers work well for you! We love to hear success stories. You will have to share your lovely creations with us sometime! They turned out very cute! And I can’t believe you didn’t eat a single one! The wafer paper images will not spread once you add them and your cookies will keep just fine for that week with the wafer paper applied already. I have bought the wafer paper.They are very nice.I loved them. but I want to store them for few months.How can I store them.Is it O.K to freeze them? There is no need to freeze or refrigerate the wafer paper. It will store just fine on a shelf in the packaging it was shipped in. You can keep the cookies in an air tight container for 7-10 days and can also freeze them to keep longer if need be. As far as shipping the cookies, you will need to be sure to layer the bagged/wrapped cookies in between bubble wrap to prevent breakage. 1) Does the wafer paper applied with light corn syrup have to dry completely before you pipe a border around it? 2) Are there different thicknesses of wafer paper? By the way, Fancyflours is awesome and gets the highest marks from me for their warp speed shipping. I was also delighted with the complimentary recipe cards and my beautifully wrapped cookie cutters. Very impressive! I will be back often! Thanks for your lovely & kind comments! I am so sorry to hear that your wafer paper was a little off this time. I know that we haven’t changed vendors for our wafer paper in years and years so all of the wafer paper we carry should be exactly the same. Therefore I am not really sure why that particular one would have been different. I don’t think piping a border on before it was completely dry would make any kind of difference though. Hope that answers your questions and thanks again for your kind words about Fancy Flours! can you use disco dust on top of wafer paper? how do you make the disco dust stick without disolving the wafer paper ? Yes you can use disco dust on top of wafer paper. You would use a small amount of clear writing gel or karo syrup in the area that you want to enhance and then lightly brush the disco dust on. Can you use the wafer paper on something other than royal icing or fondant? Or do you jus suggest those two for their smooth surfaces? I have a cream cheese icing and a cardamom icing I would rather use. Sorry for the delayed response. We are super busy around here lately! You would be fine using either of the icing choices you mentioned. Just make sure to let it dry before you put the wafer paper on. hello wonderful fancy flours- has anyone applied the edible wafer papers to chocolate?…did it work out?…if so, what method used? how well did the picture show up? i would love to experiment with them! Yes you can use chocolate, in fact here is a video tutorial on how to do so! If you have any other questions feel free to ask! saw the comment above about using wafer paper on cream cheese frosting. Would it also work with a butter/powdered sugar frosting? Yes it would work, you would just need to make a smooth surface with the frosting and let it harden a bit before you adhere the wafer paper. I ordered and received my wafer papers. Love them! Shipping was fast and packaged great. I followed the instructions to apply. They look like stickers sitting on top of the cookie. I thought they would “melt” into the icing more. I read somewhere that I should coat the paper with white syrup on TOP also. Which will make it melt into the icing. But I don’t want to lose the design. And this is contrary to what your instructions say. Any thoughts on how I can make the application look better? (next time I will try cutting my paper the same size as the cookie, then the edges will be on the edge of the cookie.) But for now I have 2 dozen cookies that need a little help. I have a feeling that my response is a little too late and I apologize. We have been super busy trying to finish up our Summer catalog that we have overlooked checking our blog for messages. Did you make sure to press the wafer paper down firmly and let the cookies dry facing down? TIP for future cookies: if the edges look a little too obvious take a little bit of royal icing and pipe it along the wafer paper edges. Can you use the wafer paper on cupcakes, or will they onlt work with cookies? Yes you can use the wafer paper on cupcakes! Just make sure the frosting is fully dry before applying it. You can also adhere the wafer paper to cut out fondant and place that on top of the cupcake as a topper. Hello! I have never used wafer paper before and I am concerned about “painting” the back of the paper with karo syrup and trying to pick it up and flip it over on top of the cookie. 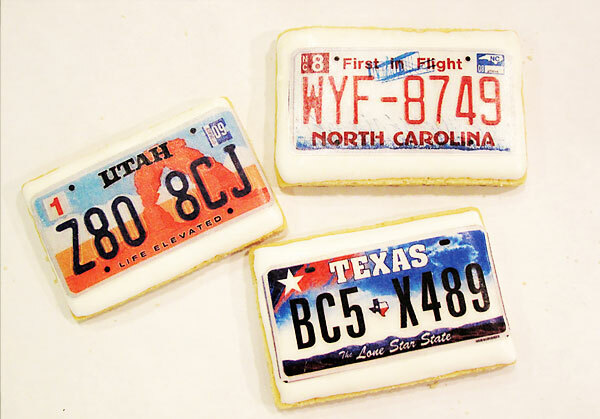 Could I “paint” the cookie instead with the syrup and then lay the paper on top? As long as you are careful it should be fine to just paint the wafer paper. That is how we always do our cookies, but I’m sure you could paint the cookie instead if you feel more comfortable. However, keep in mind that the wafer paper might not stick as well. I’m making homemade gifts for friends and family this year, and am getting ready to order wafer paper for the first time. I’m wondering……can I make the cookies with the wafer paper, fully decorated, and freeze them for several weeks so I’m not losing my mind trying to bake everything last minute? I’d appreciate your expertise. Hi Mollie – Unfortunately, you are not supposed to put cookies with wafer paper in the freezer because the moisture will ruin them. But you can bake and ice them and then adhere the wafer paper later. Great site and information! I am using the wafer papers for the first time and so far all my questions have been answered and found lots of very useful tips! Love your products!! Can you “glue” the wafer papers directly to a cookie? Or do you have to have icing? Hi Chelli – Yes you can put the wafer paper directly on the cookie, however the wafer paper will not appear to be as bright and vibrant without a white icing background. Would just a thin brush of honey work in place of the corns syrup? The honey could work in a pinch for a more saturated design, however it would take significantly longer to dry and would likely discolor the paper somewhat. Thank you for this great question! I purchased wafer paper from you as I have bought other products from you and have been very happy with them. This was my first time using wafer paper. I made my cookies, frosted and when dry applied light corn syrup to the wafer paper and placed on cookie. They looked great…However, they changed the taste of my cookies. Now maybe it was the corn syrup?? Also, when I tried to break a cookie in half it would not break because the paper wouldn’t allow it. It wouldn’t tear. I am very disappointed. Since I do love the pictures, is there anything I can do? Hi Brenda – I am very sorry to hear about that. It sounds like you could have applied too much corn syrup to the wafer paper. It should just be a very very light layer. I haven’t heard of it changing the taste, but we do sell a clear writing gel that we recommend using that has no taste and works really well. Let me know if that helps! I was wondering if your wafer paper ever expires? I have leftover Christmas wafer paper from last year, but am not sure if it’s still good. I’ve stored it in its original packaging from you, so it has stayed cool and dry. Hi Mollie – You wafer paper will be just fine since you stored it in its packaging in a cool and dry place 🙂 It does not necessarily have an expiration date as long as you store it properly.